The newest addition to our bird familyand last for awhileis Kiki, Yvonne's rose-breasted cockatoo (Eolophus roseicapillus*). These lovely birds are called galahs in Australia, where they are so plentiful they're considered pests. 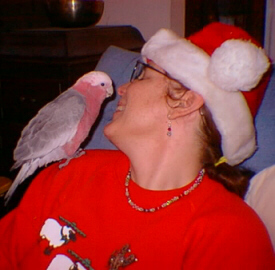 Butterfly fell in love with Kiki at Feathered Friends of Santa Fe, and she came home to live with us on December 19, 2000. So far Kiki is adjusting well to her enormous cage, and she and Six didn't hate each other on sight. We hope someday they'll be friends, but for now we'll let them take their time getting used to each other. Kiki was hatched on April 27, 2000. She can say "Hello!" and "Hi!" and also talks a lot in her cage, saying things we can't understand yet. We expect "Uh-oh!" and "Indy, no!" to be the first new phrases she learns. She told Butterfly "Hello" every morning for the first few mornings here. Recently we were watching a special on the History Channel. The announcer said, "Hello, I'm Whazname," and a very sweet, polite little voice from beneath Kiki's cage cover responded, "Hello!" She's catching on fast to things like showers and toys. 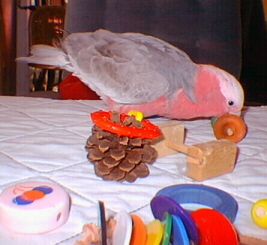 We have supervised play time with Mom, Dad, Six and Kiki, where we put all the toys on a table and let the two birds waddle around and play with them. They're especially fond of the Fetch game, where they toss something on the floor and one of the people yells, "Uh-oh!" and picks it up again. Over and over! Kiki is extremely soft to the touch, and very snuggly when she's in the right mood. Her fine big cage has been improved with a big cedar branch to stand on, plus a warm rope perch, a sandy perch, lots of toys, and a heater. She's happily settling into a life of indulgence! * Sometimes still referred to by their original species name, Cacatua roseicappilus. The Galah was classified with the white cockatoos. 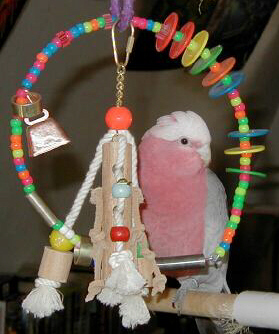 Further examination of the morphology and behavior of the Galah revealed enough differences to merit putting them into a separate genus, Eolophus roseicapillus. Visit Frosty and Sprite the Budgies.